Shugendo is Japanese original religion that have been mixed with Buddhism and Japanese original sacred mountains worship. Shugendo has in it some of the elements of vajrayana. In Meiji era, the government issued a ban of Shugen (1872). That’s why Shugendo declined temporarily. In 1947, the ban was canceled (the ban is against the constitution), so Shugendo is one of active religion. The founder is En-no-Ozunu,Japanese ascetic of esoteric Buddhism (a.k.a. En-no-Gyoja). But we don’t know whether he is actual person or?not. The principal image is Zaou Gongen. Zaou Gongen has an unique pose like athlete with joy after getting a point. Of course ZAOU GONGEN has not the root to Indian Buddhism. It’s Japanese original image. 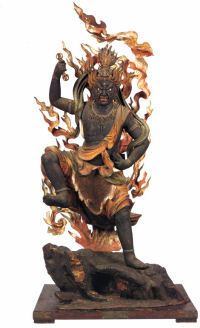 ZAOU GONGEN appeared in front of En-no-Ozunu, His character is unity of SHAKA, KANNON and MIROKU. 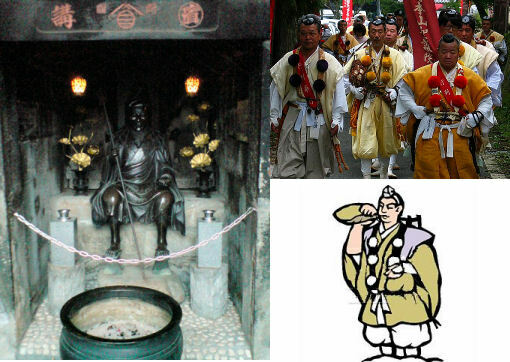 Ascetic of Shugendo is called Yamabushi. Their costume is also unique. Kinpusen-ji at Nara pref. It’s 2nd largest temple. Other main temples and mountains.